We have seen the Portland Timbers play some very good soccer to start the 2017 MLS season as they currently lead the league in goals scored after 5 matches played, and they've already broken out of the road doldrums from last season by winning their first road match of the year. 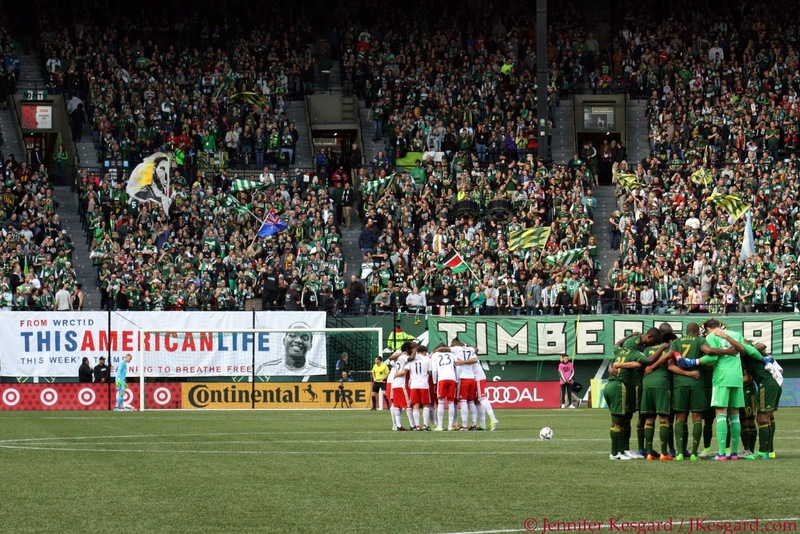 However, the Timbers let the Columbus Crew dictate the second half pace in their last match and Portland, playing without two of their key cogs in Darlington Nagbe and David Guzman, conceded a late goal in a 3 to 2 loss. With Nagbe and Guzman back and the Timbers back in the cozy confines of Providence Park, Portland hoped to return to their winning ways hosting the New England Revolution with a national ESPN2 audience watching, and the home side started out well courtesy of the Maestro and a highlight reel goal. However, the Revolution kept hanging around and capitalized on a big misplay to level the score late, and the teams played to a 1 all draw in front of another sell out crowd. 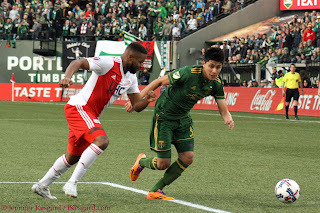 While there was plenty to complain about from this one - shoddy finishing, shaky play in the midfield, another goalkeeping gaffe, no use of substitutes and curious officiating - the Timbers let this one get away with passive, disorganized play that allowed the feisty Revs to earn a point for their troubles. 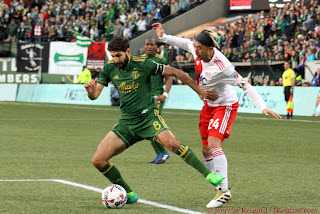 Timbers Coach Caleb Porter was pleased to have his full roster of players available with 2 exceptions, as defenders Liam Ridgewell and Vytas continue to nurse leg ailments, but Porter wasted no time in putting Guzman in his familiar defensive midfield role alongside Diego Chara. 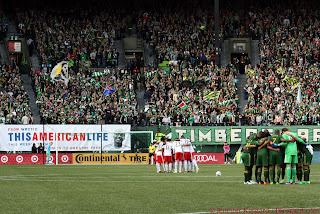 Nagbe was flanked out on the left with Diego Valeri patrolling the middle and Sebastian Blanco manning the right wing in support of forward Fanendo Adi, and this attacking foursome has been lethal to defenses during the month of March. Defensively, Porter made one change to the group that he's used for the last 2 matches as young Marco Farfan (who played so well in the Timbers road win over the Los Angeles Galaxy back on March 12) would start at left back alongside center backs Lawrence Olum and Roy Miller with Alvas Powell starting at right back. Jake Gleeson, who had some questionable decisions in the Crew match, would again make another start in goal as Porter decided to leave Jeff Attinella on the bench. One of the biggest issues in the Crew match was the lack of pace and movement, especially in the second half, so Portland would need Guzman and Nagbe to inject some energy to jumpstart the offense. New England possesses some of the best attackers in MLS with Juan Agudelo, Lee Nguyen and Diego Fagundez, but the team made a big move to add firepower with adding Kei Kamara to the mix up top. With Kelyn Rowe and newly signed Xavier Kouassi manning the holding midfield spot, the Revolution have plenty of offense. The question has been on the defensive side, especially with Revs Coach Jay Heaps playing rookie Joshua Smith instead of Benjamin Angoua, who had started the last 3 matches, due to Adi's size. With young Cody Cropper in goal for his fourth start, it was up to veterans Andrew Farrell and Chris Tierney to keep the backline organized, especially with the Revs playing their third road game to start the 2017 season. Veteran official Kevin Stott would be the man in charge of making calls, and with Heaps making it a priority for his players to be physical and try to frustrate the Timbers, it would be interesting to see how the match would be officiated. The Revolution hit the ground running and earned the first chance off a corner kick when Nguyen found Rowe on the left post, but his header went into the side netting. Nine minutes later, the Timbers were finally able to push forward and Chara launched a speculative cross from left to right that flew over Adi but was in the wheelhouse of Valeri after Tierney tried to head it away. The midfielder executed a wonderful turn and shoot that caught Cropper and the New England defense flat footed, and just like that, it was 1 to 0 Portland. The rest of the first half was a spirited back and forth affair, but it did feature some of Stott's handiwork in terms of officiating. In the 26th minute with the Timbers and Valeri breaking out on the attack, Kouassi tried to stop Valeri with a tackle; while he did get the ball from behind, his trailing leg caught Diego from behind and dropped him to the turf. Stott not only didn't whistle a foul, but didn't give out any cards, even though New England had two other situations that could have drawn discipline. In the 34th minute, Adi was dropped by Smith along the backline with a slight trip, but at least Stott whistled the foul despite Smith being last defender. The final issue was in the 43rd minute when Rowe grabbed Nagbe on an attempted drive by the jersey to stop the progress. Heaps said in his post match comments that Stott would let the teams play on the afternoon, and it appeared the Revolution took him at his word even though Kouassi earned a caution just before the break for a hard tackle on Guzman. Neither side chose to make any player changes, but there was the potential for a move when Rowe dropped Farfan with a hard tackle in the 49th minute and stepped on his foot in the process. The contact drew a card from Stott, but did little to stop the physical play from the visitors. After Guzman just missed in the 52nd minute off a drop pass from Blanco on the right that New England couldn't clear with a high shot, the Timbers offense looked prime to finally break it open. Adi had 2 golden chances to add to his account, firstly in the 78th minute off a diagonal ball from Valeri on the attack that Farrell allowed to pass through, while Powell found his striker in the 88th minute off a cross in the box that Adi headed high. However, the second miss came when the match complexion had changed courtesy of Nguyen; the Revolution put a cross from the right towards substitute Teal Bunbury at the right post that he bumped on goal, and Gleeson deflected the shot away but spilled it in front of goal where Nguyen could easily pounce upon it. The crafty veteran punched it past a sprawled Gleeson to level the score; while Gleeson shouldn't have spilled the ball, the defense got stretched with Olum covering Bunbury and Miller missing a chance to clear the ball. Neither side was able to create any additional chances despite 6 minutes of second half stoppage, much of it due to Smith crumpling to the turf with cramps at the 87th minute and staying down for quite a while. While New England could be happy by grabbing the point towards the end of the match despite limited chances and possession, the offense still wasn't firing on all cylinders. 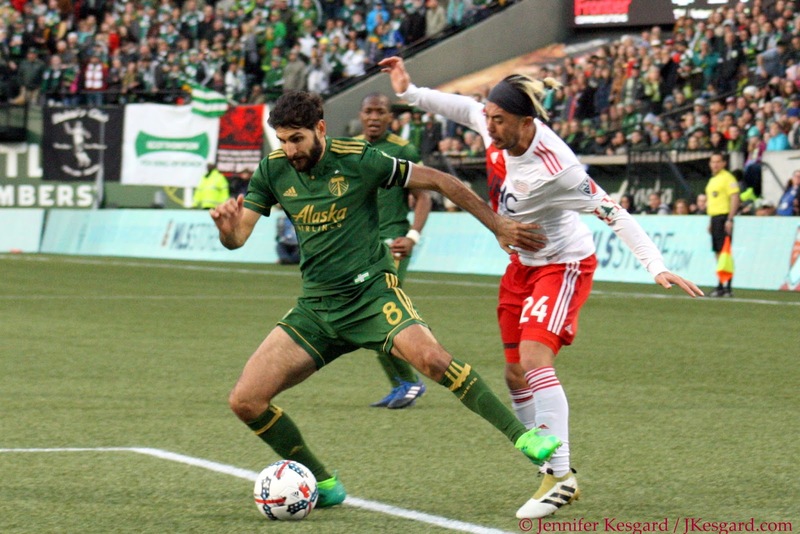 For the Timbers, they scrapped for an early goal to give them a lead, but their finishing kept them from adding another goal and sealing the win. Part of that was the pressure from New England, some was from Stott's influence after certain foul calls, but a big portion was the Timbers playing more passively, especially in the second half. While the team also was getting frustrated at the lack of calls on the Revolution, they failed to capitalize on various attacks due to impatience and rushed finishing in the box. Finally, Gleeson spilling a ball into traffic was bad enough to give New England a chance to draw even, but the defense didn't aid things by not clearing out threats sooner. While the Timbers got the draw to keep a point, this was an easily winnable match with some slight changes - and Portland now turns their attention to the road when they play the Philadelphia Union on April 8.